More than 70% of the world’s fisheries are currently being harvested at capacity or are in decline, but fish are also delicious and quite good for you. What’s a conscientious diner to do? The conventional wisdom has always been to avoid big fish at the top of the food chain–marlins, sharks, and tuna, for example–and focus on little fish, like sardines and anchovies, which have shorter lives and can reproduce more quickly. Not so anymore. Your fish choices just got even more complicated. After analyzing over 200 scientific fisheries assessments, Stanford researchers found that small fish populations were just as likely to have collapsed in the past 50 years as larger fish, mainly due to overfishing. We’re literally killing all the fish. Small fish often die and reproduce faster than larger fish and, in general, population drops in small fish last five years on average, compared to 15 years for larger fish. But this isn’t always the case, according to the researchers. 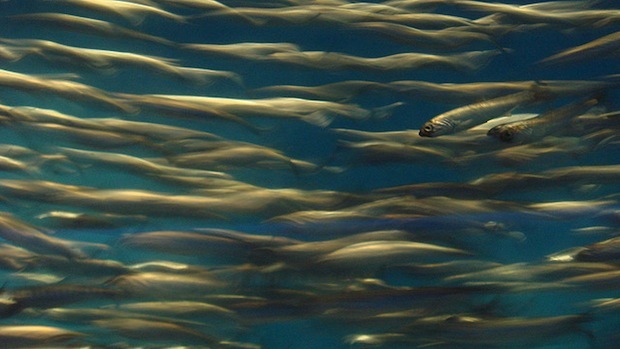 For example, one collapsed sardine fishery in Monterey Bay took decades to get back to normal levels. Here’s the bottom line: We can only eat fish–of any kind, it seems–when they’re fished in very specific and careful ways. So what can we do? Not much, at least on a large scale. Individual fisheries need to be on constant alert for overfishing, no matter what they fish. The rest of us need to learn to appreciate anchovy pizza a little more. One day, it may be a rare delicacy.